For over a century, crayons have been children’s first method of graphic communication, a way of visually representing their world. Given a box of crayons, all children seem to innately know what to do with them. Many people find it odd that I teach crayon drawing in my studio. Naturally, they assume I am teaching small children. But I am not. I use crayons as a quality fine art medium. They have high-quality pigments and use high-quality wax as a binder. Most of the colors have the same lightfast qualities as your more expensive colored pencils, but I love the hallmark look that is not achieved with anything but crayons. The first thing to remember when working with crayons is that you are not going “backwards.” Yes, they are inexpensive to buy, but they are not cheap. However, I do suggest using the original brand, Crayola. While there are many other brands out there, I find that crayola is the best for professional use due to its richly pigmented colors. The bargain brands are a bit heavier on the wax, which is fine for kids, but the colors are not as rich. When teaching my students how to draw with crayons, I have to keep reminding them that while some of the techniques are similar to colored pencils, the look is unique. Please, please, do not try to compare the two! Do not try to beat them into submission to make them look like colored pencil. If that is the look you want, simply use colored pencils instead. You must accept and embrace the differences, and allow crayon to be crayon. The result is a wonderfully unique piece of art that only crayons can produce. Sometimes a subject that looks difficult to draw really isn’t. 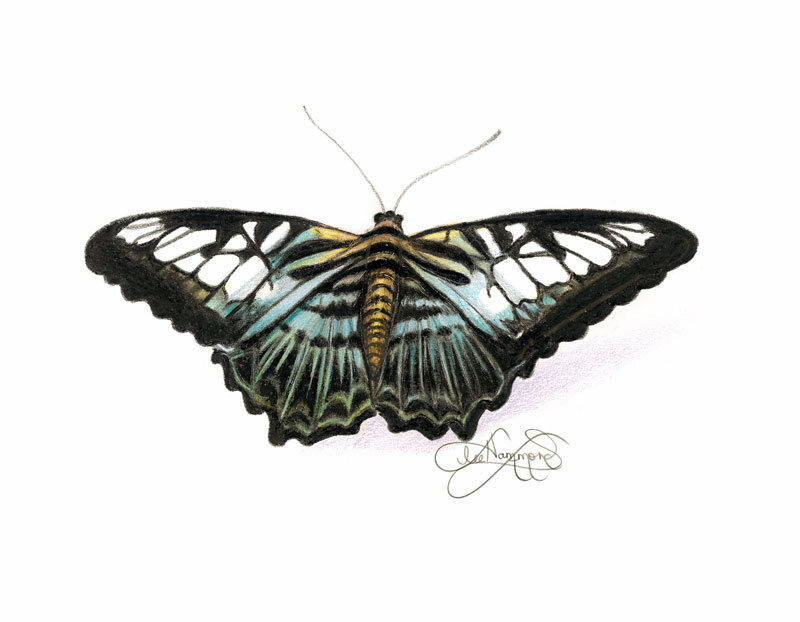 Butterflies look extremely complicated, but I find them fairly easy to draw. This is because their patterns can be broken down into puzzle shapes. The black outlining of the colors goes on last, pulling everything together. 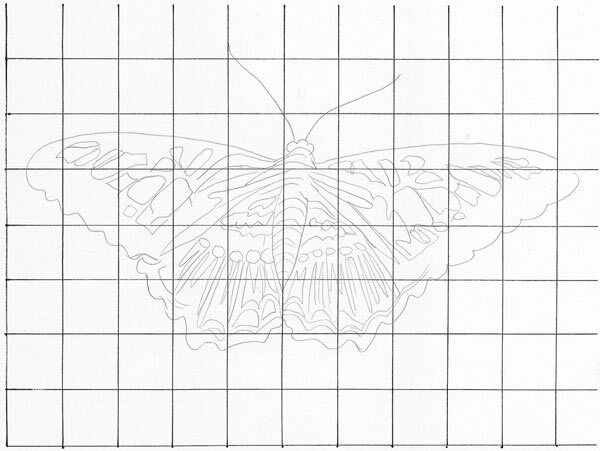 Use this graphed line drawing as a guide to draw the butterfly. Lightly draw a 1-inch (25mm) grid on your drawing paper in pencil. 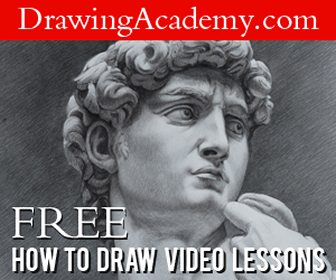 When you are sure of the accuracy of your drawing, carefully remove the grid lines with a kneaded eraser. Be sure not to inadvertently remove any of the important lines needed to create the patterns. Add the lightest color first. Start with Goldenrod and place it on the body and upper portion of the wings. Add Brown along each side of the body and onto the head. Add Gold to the outside patterns within the wings. Add Aquamarine to the wings. For the darker areas of blue, use Periwinkle. When all of the lighter colors have been applied, it is time to add Black. With a sharp point, fill in the smaller lines and areas first. Continue to add Black to the patterns. 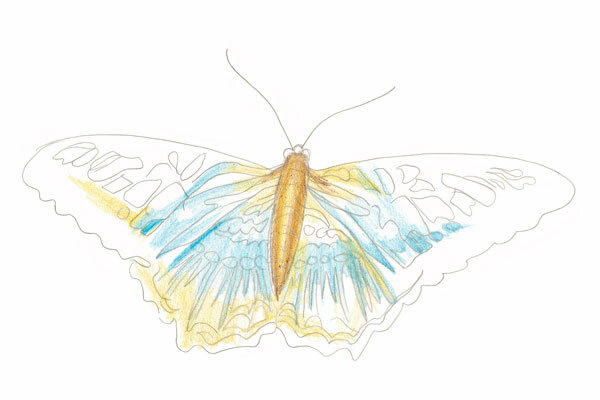 Use a craft knife to gently scratch out the delicate lines in the patterns of the lower wing. Whenever you are drawing something with patterns where black is the most dominate color, it is important to place the lightest colors down first. NEVER apply the black first; it will smear into the light colors and ruin them. The above is an excerpt from the book Amazing Crayon Drawing with Lee Hammond: Create Lifelike Portraits, Pets, Landscapes, and More by Lee Hammond. The above excerpt is a digitally scanned reproduction of text from print. Although this excerpt has been proofread, occasional errors may appear due to the scanning process. Please refer to the finished book for accuracy. Lee Hammond, author of Amazing Crayon Drawing With Lee Hammond: Create Lifelike Portraits, Pets, Landscapes and More, has been a professional illustrator and instructor for more than 30 years. She has been an author for North Light Books since 1994 and has published over twenty titles. She is a certified police composite artist and is on call for the Kansas City Metro Area police departments as well as TV’s America’s Most Wanted. She has illustrated many of the NASCAR drivers, selling prints on QVC and NASCAR.com, and on her website, www.LeeHammond.com. Many of her art creations can be purchased from her onine art gallery. She continues to add new art on a regular basis. Lee’s passion is and always will be teaching, and she currently teaches workshops full time nationally and internationally. She divides her time between Kansas City and Naples, Florida. I have experimented with scholastic crayons before, but your work certainly inspires me to give it another try! whoever drew that is very talented. i loved it. I hate to admit that when I first started reading this post, I expected something drawn by a child. That was my first thought because when I think of crayons, I think of children. What an amazing surprise to see the finished drawing! It is a truly beautiful butterfly. I had no idea crayon drawings could be so pretty.